2013 is a big year for Slovakia, the little country sitting at the heart of Europe. The Eastern Slovakian city of Košice has been selected as this year’s European Capital of Culture, and the city has planned over 300 cultural events in honour of the distinction. Today our Slovakian guide Hana suggests a range of delightful places you may want to visit in her homeland, including castles, mountain landscapes and traditional folk villages. Slovakia, the country of tourism, begins in the southwest, where the River Danube enters the area near Devin Castle. It is a modern country in the middle of Europe with an ancient history. All year long it offers tourists its attractions, historical sights, natural looks, cultural entertainment and warm Slovakian hospitality. The hilly mountains attract tourists and climbers, while the Karstic Mountains offer caves and walking routes. Slovakia is not rich only in mountains but also in its water areas and rivers, wine regions, castles and chateaus, and spa resorts. There are many places in Slovakia where you can experience different adventures for every day in the week. In Slovakia you can rent saddle horses for rides or just rent a bike and take a ride through the beautiful nature. Hiking and walking is also a popular way to relax here. Being a tour guide myself I know how important it is to understand the client's expectations. Therefore it is really difficult to highlight just a few places where tourists should definitely go: my favourites might not end up being yours! But I will share with you a few excellent destinations that showcase Slovakia’s nature and history. For people who love mountain scenery, I always suggest visiting the High Tatras, Slovakia's highest peaks. Here you will find ideal terrains for hiking, skiing down the mountain slopes in winter, or you can just take a cable car up to some peaks for views. In Slovakia there are many open air museum of folk architecture which takes you closer to the harmony of folk architecture, fine arts and music. My top one is Vlkolinec, situated in the centre of Slovakia, it is one of the Slovak villages that have been given the status of a Folk Architecture Reservation. Vlkolinec has been listed as a UNESCO World Heritage Site since 1993. 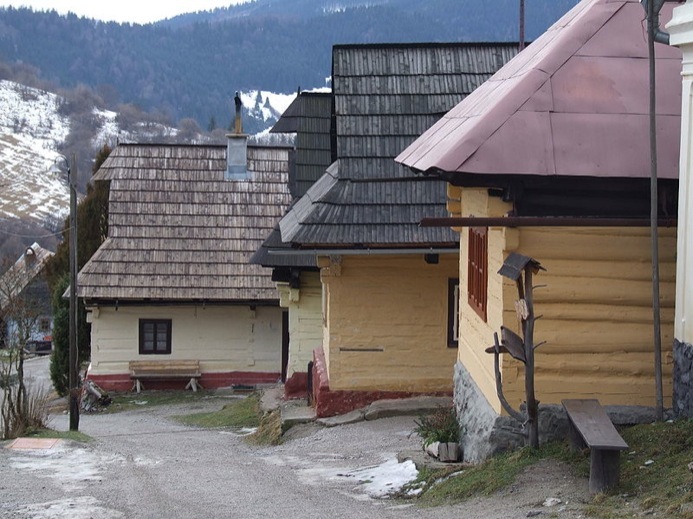 The village shows intact settlement of 45 buildings with the traditional features of a central European village. Cicmany is a village in Zilina District in northern Slovakia. It has a status of the first Folk Architecture Reservation in the world (since 1977). The houses are typical for its white patterns painted on the exterior walls. The Slovak Olympic team was also inspired by these patterns, which were pictured as a symbol of Slovakia on their T-shirts during the Summer Olympic Games in London in 2012. Castles and Chateaus are also typical for hilly areas in Slovakia. Bojnice Castle is considered to be Slovakia's top castle. It is the most beautiful romantic castle in middle Europe. Bojnice is one of the most visited castles in Slovakia also for its international Festival of Ghosts and Spirits, and Summer Music Festival. I would also like to mention the capital city of Slovakia: Bratislava. You can get a nice tour around the town with its richly historical monuments. Bratislava has a strategic position, very close to Vienna and Budapest. This trio of capital cities are the closest capital cities in Europe. I have only mentioned here a few places which you should visit when coming to Slovakia. As I explained, it is up to you to pick and choose what to see: there is definitely a lot to explore! Thank you Hana! Travelers planning to head to Slovakia in 2013 should definitelyget in touch with Hana to experience this beautiful country with an expert local guide.